Can I run while grilling? Have I mentioned that I’m going to Mexico in a few weeks? I’m pretty sure I have, but I do like rubbing it in. I know I’ve told y’all, but my friend Colleen is marrying Andy there. Several of us are going without our husbands. What? Don’t judge. Sure, The Man would love to come to Mexico with me, but he volunteered to take The Kids camping for Father’s Day weekend instead. I’m going with most of my best friends. We’ve known each other for 20 years or more. We spent many spring break weeks in Ft. Lauderdale, Destin, and Nashville. We’ve grown up since then. Unfortunately, after that long and two kids, I’ve also grown out. My friends laugh when I say that, but everyone has a personal standard, and because I’m tallish, I must hide it well. Honestly, it’s my fault. I’ve loved living my life. I mean, I’m just sort of at the point where that personal body standard has been violated. Time to work out more. Enter the infamous broken finger. BBF (Before Broken Finger), I was playing tennis 4-5 times per week, and that kept me in pretty good shape. ABF, something had to change. I even started running a little, thanks to those cute (blue!) running shoes. I’ve admitted to liking running, but I needed more. Enter my trusty friend Andrea. She has sufficiently kicked my tail into high gear. I’m actually enjoying exercising. I didn’t like that I couldn’t walk up (or more painfully, down) the stairs for 3 days after the session with her, but if I’m sore, it’s working, right? Yep. And I’ve even noticed a big difference. Lesson 1: Stay active. Exercise regularly. Additionally, I’ve starting cooking differently. I love my family’s red beans and rice recipe. I love my spinach and sausage lasagna. I love Vallarta. The list goes on and on (steak, cheeseburgers, wine, margaritas, French fries, cheese, and more cheese and wine). We needed to eat a little better. I’ve found a new hobby in grilling. You really can grill just about anything. I’ve accomplished ribs, a whole chicken, potatoes, corn, asparagus, a picnic roast, burgers, and much more. However, my favorite meal is a grilled salad. I didn’t make it up, but I’m pretty sure I’ve perfected it. Grilled salad? As in, soggy, hot lettuce? Oh, just you wait. Because y’all asked (maybe you didn’t, but some did), here’s the basic recipe. Take whole romaine and slice it in half lengthwise. Leave the stem end on, so it won’t fall apart on the grill. Drizzle olive oil, salt, and pepper on each half. Put them face down on a medium heat grill for 2-3 minutes. You’re just watching for the leaves to curl and brown a little. Remove from the grill and let cool. That’s it. My new favorite way to top the lettuce is with a little goat cheese, sliced grapefruit, and green onion. The dressing is olive oil, grapefruit juice, salt and pepper. 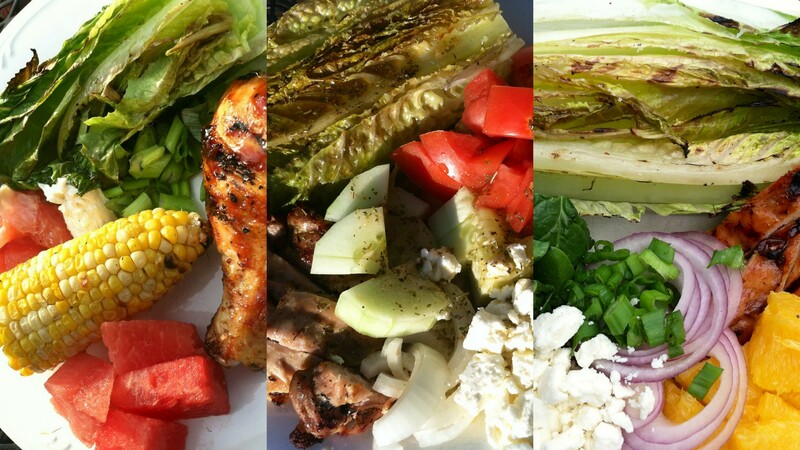 However, you can add grilled chicken, fresh tomatoes, feta, oranges, Greek salad fixins or whatever you like. Grilling the lettuce gives it a richer taste, but it’s still low in calories. Lesson two: Eat better. Find foods you enjoy, and cook them in a variety of ways. That doesn’t mean giving up everything you love, trading it all for rice cakes and Lean Cuisine. I’ve just found that fad diets or quick fixes aren’t the answer. As soon as you get back to eating all of the “good” (read: fats or carbs) foods, the weight will come right back. I’m no expert. I just want to wear a bathing suit this summer. I want to keep eating flavorful food in moderation, and I hope my love for exercise continues to grow. Besides, if I can do that, I’ll still have room at the end of the day for a good margarita or a glass (or three) of wine. As always, cheers! just wanted to say that I look forward to your article every week, you’r awesome. keep up the good work. CHEERS!